The Crippled God is the tenth and final volume in The Malazan Book of the Fallen, a fantasy about as epic as epic gets. The series began with Gardens of the Moon where many of the main characters were introduced. Some of the best ones seemed underused in later books: Segeant Whiskeyjack, for instance, gets killed off (although returns as a minor character as a ghost/zombie along with many of his men); Ganoes Paran, as the Master of the Deck, seems like he will be a pivotal character, but later becomes fairly peripheral; ditto the mysterious and idiosyncratic Kruppe. The next book in the series, Deadhouse Gates, abandons the characters and plot of the first book and introduces a whole new range of personnae on a whole new continent. It was only when I read the third book, Memories of Ice – which returned to many of the original characters – that I started to really enjoy The Malazan Book of the Fallen. The next couple of books, if I remember rightly – House of Chains and Midnight Tides (one of which introduces Karsa Orlong, an awesome character who, again, doesn’t live up to his early promise) – were also very enoyable. After that, however, with The Bonehunters, Reaper’s Gale and Toll the Hounds, the whole story gets increasingly difficult to keep track of. I used to be the kind of person who would reread a whole series to date in order to maximise my enjoyment and understanding of the new book (I’ve read The Eye of the World about five times, for instance); nowadays, however, I have a life. Erikson doesn’t make it easy for the reader, either. There are no summaries of the story at the start of the books, the characters don’t have ‘As you know …’ conversations elaborating on what they’ve done and what they plan to do, and there’s very little infodump in the text. 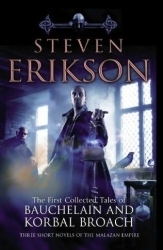 Books nine and ten of the series – Dust of Dreams and The Crippled God (I should point out that Erikson does have very good taste in choosing novel titles – they’re all punchy and evocative and don’t rely on cheesy made up names) constitute a novel split into two halves. Reading them, I tended to feel that the series has let itself down a lot – and that I’ve let it down, by failing to memorise all the characters, factions, histories, nations etc, etc and their relevance to the current action. On the other hand, unlike authors such as Robert Jordan and George R R Martin, who seem to have bitten off more than they could chew when they started writing their own fantasy series (Jordan didn’t even live to see the conclusion of The Wheel of Time), series that constantly telescoped into increasing numbers of volumes that took longer and longer to write, Erikson has very remarkably kept his story on schedule. Ten books were always planned and ten books have bee published, each one only a year or two apart. Even so, with a gap of a year or two between reading each one, you forget what has gone before and its difficult to figure out who’s who and what’s what. The lack of comprehensive and concise synopses on the internet doesn’t help you get reacquainted with them. And so to the book itself. In the aftermath of a terrible battle in the previous volume, the Malazan army and its allies led by Adjunct Tavore Paran, split up with Tavore’s Bonehunters taking an impossible route across a vast desert. The armies converge on their enemies, who are led by incredibly powerful Forkrul Assail, and battle ensues. Meanwhile, at the Shore, another group of protagonists engages in a slightly lesser, but still pretty epic battle with Tiste Liosan who are trying to claim the territory for themselves. Also, the Jade Strangers, a pair of gigantic objects slowly approaching the world from the sky and the Crippled God inches towards reincarnation. Along the way to the story’s ending, various characters meet their ends; others reappear after several books’ absence and the reader is supposed to remember what the deal is with them. Shadowthrone and Cotilion pop into the narrative every now and then, dropping hints – as they’ve done all series long – about their epic and fiendish plan. I still don’t really know what it was. The body count is pretty impressive. Some characters die in the course of bloody battles, giving their lives for their comrades. Others have less worthwhile fates. This is a spoiler, but another of the best characters in the series – Gruntle – dies in the course of a fight with another character, and there’s apparent reason for it, other than he encountered her and decided he should try to kill her. I don’t want to spoil too much but the Crippled God’s eventual resurrection is quickly shown to be irrelevant. The Bonehunters’ march through the Glass Desert ultimately seems equally pointless. Erikson’s writing is as spare and dialogue-filled as ever. In much of the book,especially early on, there are lots of inner monologues as the characters contemplate what’s ahead of them – and they become tiresome pretty quickly. I found myself wishing at several points that there were fewer characters and more descriptive writing. On the rare occasions when Erikson describes a character, it’s a surprise – So that’s what they look like, you think. 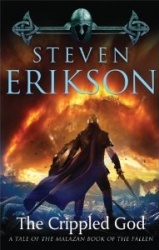 All in all, while the breadth of characters and powers at work in the world – actually, worlds – of The Malazan Book of the Fallen is breathtaking, on finishing the series you come away with the impression that Erikson threw a load of cool things in the melting pot and ultimately didn’t really know what to do with them. There’s a certain satisfaction to the scale and brutality of the concluding battles, but that’s about it. I’d like, one day – let’s make it one year – to reread the whole series, book by book, and see if the heads and tails of it resolve into discrete units. Or maybe I’ll just go on the messageboards and see what others made of it. Steven Erikson’s ten-volume Malazan Book of the Fallen series is one of the best and most important fantasy works of recent years. Important because it takes the concept of ‘epic fantasy’ to another level, telling a story that takes place on multiple continents, involving multiple sentient species, parallel magical worlds called warrens that are the source of different varieties of magic, a convoluted pantheon of gods and god-like beings and a cast of scores, maybe hundreds of viewpoint characters. It’s so vast in its scope and ambition that it’s actually quite difficult to keep track – even vaguely – of everything that goes on; sometimes its complexity is its own worst enemy. Night of Knives is a much simpler narrative to digest. The world of the Malazan Book of the Fallen was created by Erikson and Esslemont for the purposes of roleplaying gaming. Erikson has enjoyed great success with his books, and since then, Esslemont has also begun contributing to the published canon. Night of Knives is the first of several books by Erikson’s friend that fill out the story being told in the main sequence. In it, we see what happened on the Night of Knives, an event that is referenced several times in Erikson’s books, but that happens before the first volume, Gardens of the Moon. 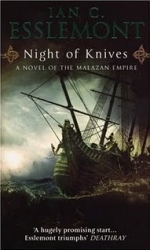 Night of Knives is short compared to Erikson’s books – only 450 pages, and not much text on each page. There are also only two main viewpoint characters and the action takes place in one city – Malaz – and over a single night. While Malaz gives its name to the huge, militaristic Malazan Empire, it’s protrayed as a backwater town that has been superseded in importance by other Malazan acquisitions. It feels authentically Malazan, however, and to whatever degree Esslemont deliberately tried to model his work on Erikson’s, he succeeded. The characters generally work well within the context of the two series of books. Temper is an old soldier – a classic Malazan character – jaded and bored. Kiska, on the other hand is a young woman who fancies herself as a spy and who takes it upon herself to follow some mysterious characters when they turn up in Malaz. While Temper fits perfectly into the Malazan scheme – his backstory is also part of Malazan history – and his presence and importance in the Night of Knives is apt, Kiska, on the other hand, is a little contrived. She just happens to want to do what the narrative requires of her and she survives the night only by good fortune and the tolerance of various powerful characters. I didn’t dislike her, but Temper seemed the more well conceived of the two. The quality of Esslemont’s writing wasn’t quite as good as Erikson’s, but it was still pretty good. For the most part things moved along swiftly and the descriptions were direct and effective. There were a lot of flashbacks early on, however, that held back and confused the narrative. I noticed three uses of the word ‘mulch’ that seemed unusual: twice referring to the surface of the sea – being mulched with ice, or something similar – and once to brains bursting out of someone’s head that was being crushed in the jaws of a giant hound. I had a little problem with the format of the book. As I said, there wasn’t much text on each page; the typeface wasn’t especially big, but the column of text was quite narrow. The publishers did this because fantasy books are supposed to be fat – that’s what readers want. That narrow column, though, made me feel I was reading something dumbed-down or aimed at children. In some ways, this was an easier, more enjoyable read than any of the main sequence books, but in other ways it was less satisfying. Firstly, it’s a prequel – and prequels are kind of pointless: by definition, you already know how it’s going to turn out. Secondly, the size and scope of Erikson’s books – the challenge of following the multi-layered story – are part of those books’ appeal; Night of Knives is a different kind of novel. Thirdly, the characterisation – while perfectly in keeping with the Malazan Book of the Fallen pattern – was a little shallow in the context of a book where there are only two protagonists. Still, Night of Knives is a decent read and a must for any Malazan Book of the Fallen fan.